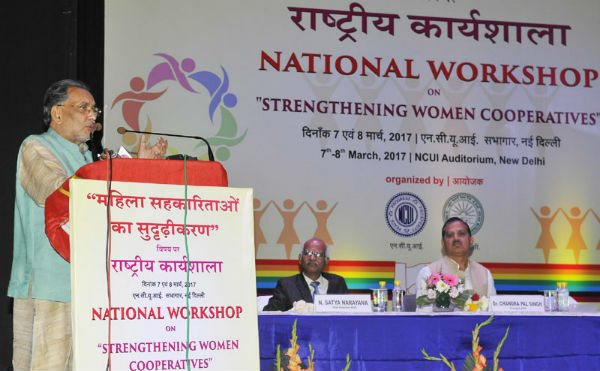 New Delhi: The Union Minister of Agriculture and Farmers Welfare, Shri Radha Mohan Singh has said that it is imperative to provide financial help to women so as to strengthen women cooperatives in the country as there is great potential for the development and success of women cooperatives. Shri Singh further said that if this movement continues, more and more women will be benefitted through women cooperatives. Shri Singh briefed it on a national workshop on the subject of strengthening of women cooperatives organized by National Cooperative Development Corporation (NCDC) in New Delhi, today. Almost 200 women linked with cooperatives across the country participated in the workshop and interacted with each other about different schemes related to women cooperatives. Agriculture Minister stated that there is 1.2 billion population in India out of which about 70% population of India resides in rural areas. Women play an important role in sowing and harvesting process and in the aftermath scenario as well. Shri Singh further added that only about 20,014 cooperatives are run by women out of the 8 lakh cooperatives in the country. Shri Singh said that the Ministry of Agriculture and Farmers Welfare ascertains partnership of women in all of its schemes as well as its programs and earmarks 30% funds for women. Since, 2013-14, States and implementing agencies have been advised to utilize 10 to 20% of the funds for the livestock owned by women under the existing Centrally Sponsored/Central Sector Schemes for the empowerment of them. In addition to this, the deployment of one female scientist in every Kendra has been made compulsory in 668 Krishi Vigyan Kendras spread all over the country. 3.1 lakh female agriculturists have been trained during 2016-17 by these Krishi Vigyan Kendras across the country. Apart from this, the participation of women agriculturists has been ascertained in different programmes like frontline demonstration and agricultural demo being conducted by Krishi Vigyan Kendras. Now, the Ministry of Agriculture and Farmers Welfare has decided to celebrate 15th October of every year as Female Farmer Day. 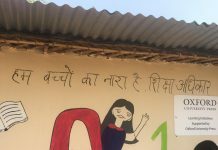 A gender knowledge portal has been developed for women farmers in which the data and information related to women farmers have been displayed. Apart from this, the women have been linked actively with fisheries related activities like collection of fishery seeds, catch of small fishes, mussel, eatable oaster, collection of marine vegetation, fisheries marketing, fisheries processing as well as products development etc. They are providing training and micro financing for increasing their partnership and participation in fisheries sector so that their potentialities might be raised by organizing them in a cluster resulting in a spirit of inspiration towards this end. Shri Singh further stated that the National Cooperative Development Corporation (NCDC) specifically aims to provide funds for the production of agricultural yield, processing, marketing, storage, export as well as import etc. NCDC provides financial assistance to women under the several programmes being run for weaker sections. NCDC provides loan upto Rs. 50 lakh for programmes related to women cooperatives. Further, the schemes above the range of Rs. 50 lakhs enjoy the loans available on 0.50% and 0.25% less interest rate respectively. On this occasion The Minister said that a Central Institute for Women in Agriculture, Bhubneshwar has been established for women agriculturalists by Indian Council for Agricultural Research. This is the first and only institute for the women associated with agriculture in the world. Thereafter, Shri Radha Mohan Singh also chaired the 81th meeting of General Council of the National Cooperative Development Corporation. On this occasion Shri Singh stated that financial sanctions amounting to Rs. 17,334 crore have been given till 28.02.2017 as well as a sum of Rs. 11,579 crore has been distributed. This amount is almost double as compared to the distribution target of Rs. 6000 crore this year. During this period the net NPA of the corporation has been nil and the recovery rate of the loans is more than 99.59%. Shri Singh congratulated the Managing Director, NCDC and her team for performing even better during the current year 2016-17. While expressing his expectations Agriculture Minister said that NCDC will continue its endeavors for the weaker sections through programmes related to fisheries, dairy, poultry, handloom, cooperatives concerned with SC/ST and specifically for the development of the cooperatives located in North-Eastern region as well as underdeveloped areas.